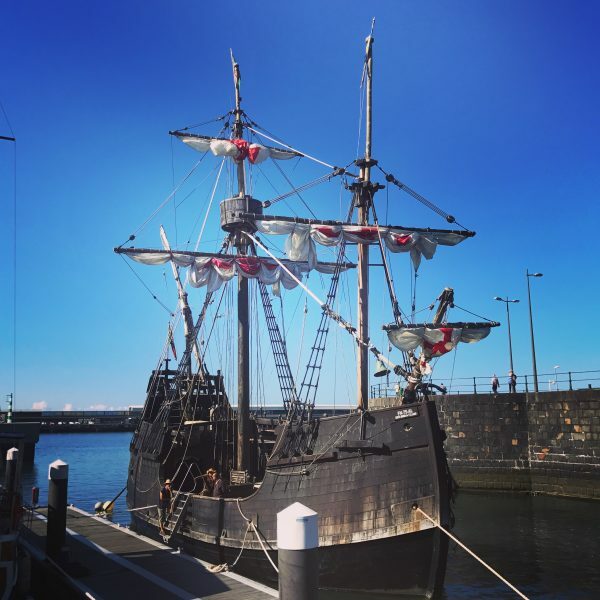 Me and my husband wanted to visit Madeira for a while but it was not until recently that we got this exciting chance, and were totally satisfied with our choice. It is not one of those islands that you hear about all the time, so we had a huge element of surprise while we were there (I must say all pleasant surprises). Planning our trip was a bit tough because you do not find as detailed info online as you find for some of the other, more popular and regularly visited islands. About 2 hours flight away from Lisbon, lies this beautiful small Portuguese island in the middle of the North Atlantic Ocean. Madeira is scenic, laid-back and full of culture. The island has rich flower life which you do not expect before you hop on a trip to this wonder island. It could also be because of the great irrigation system on the island, where water from mountains is carried via the long channels to the fields and lower areas of the island. These historic water channels are called “Levadas” and are one of the attractions too. The higher and north parts of island get a lot of rain as well. Madeira is NOT the island for a classic beach holiday – unless you already have been swimming in the sea in Iceland and enjoyed it ;). The ocean is good for a quick dip, but for spending good amount of time in water, I find it a bit cold. But, this should not stop you by any means to go there as the views only would make up for this. The island has a lot of nice hiking and walking trails, and hiking is one of the biggest attractions on the island. This should not be missed by any means. You can hike up the Pico Ruivo (1862m) and enjoy the stunning views over the clouds on a good day. Do not plan this for a rainy or completely cloudy day. There is a five hours trail or a 2.5 hours trail, and both end up to the peak. We took the shorter one and loved it. The trail is well marked and paved so I would not even classify it as a “hike”, rather a nice walk up. I was super excited for this one and was making all the wishes for seeing the dolphins on this trip. Luckily, we did end up seeing two different types of dolphins and I was blown away with the experience. We took the trip with an old pirate sailing boat (http://www.santamariadecolombo.com) and that was an experience in itself. If you are even more lucky, you might end up seeing whales and big ocean turtles as well. Try to take the morning tours as chances of seeing dolphins are higher (at least that is what I heard). This hike is in the very East part of the island and the round trip takes around 3 hours (4km return). It is also a basic hike as the path is not very difficult (just watch out for the height as you do not want to risk falling here). The views are breathtaking – ocean hitting the mountains and those bays. It is not recommended for people with fear of heights. You can take a quick dip in the ocean in certain parts during the hike. This was one of the most exciting experiences I had in my travels. No matter if you stay here, eat or simply visit, you cannot miss this in Madeira. Fajã dos Padres (http://www.fajadospadres.com) is a small organic farm between the ocean and the lower base of a huge cliff where you can arrive only via cable car or boat. You can go by car till the cable car with no problem. There are about 6 cottages to rent for overnight stays (minimum 2 nights recommended). They also have a great restaurant where you get food made from the farm grown vegetables and fruits. You can enjoy fresh seafood as well. Everything is just perfect about this place. If you do not stay here, you can visit from 10am till 6pm (check website for timings). After 6pm, restaurant closes and you will have the farm, your beach cottage and the ocean waves for yourself. 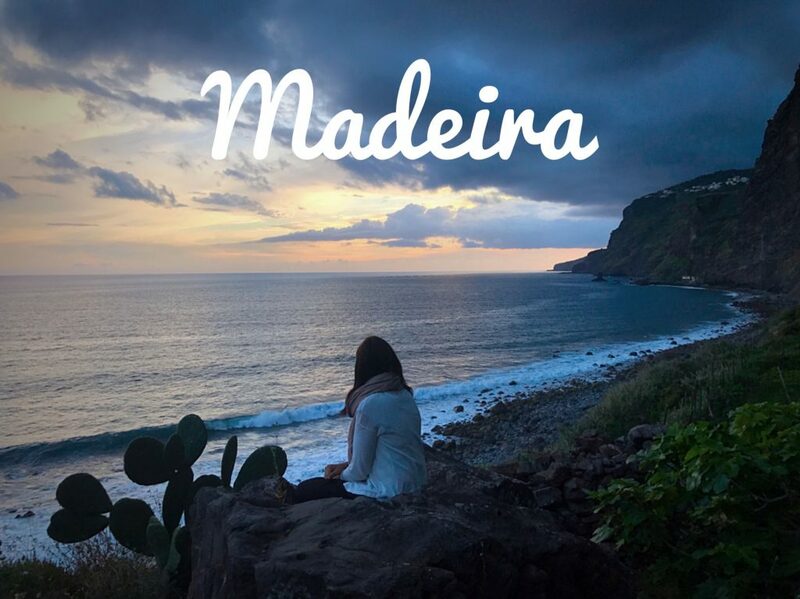 Make it a priority for Madeira (and if you find it available for overnight stays, just do it). Balcões is Portuguese for balconies. This is a short walk starting at Ribeiro Frio and ends at the viewpoint with great views over the Ribeira da Metade valley. Renting a car would be very handy on the island. Avoid the touristic Lido area to stay away from the crowds and big complex hotels. No matter what time of the year you visit, bring some kind of jacket and a scarf. The evenings can get chilly depending on where on island you are. On heights, it can be chilly during the day as well. The most scenic restaurants aren’t the best for food (may be good for snack and drink). 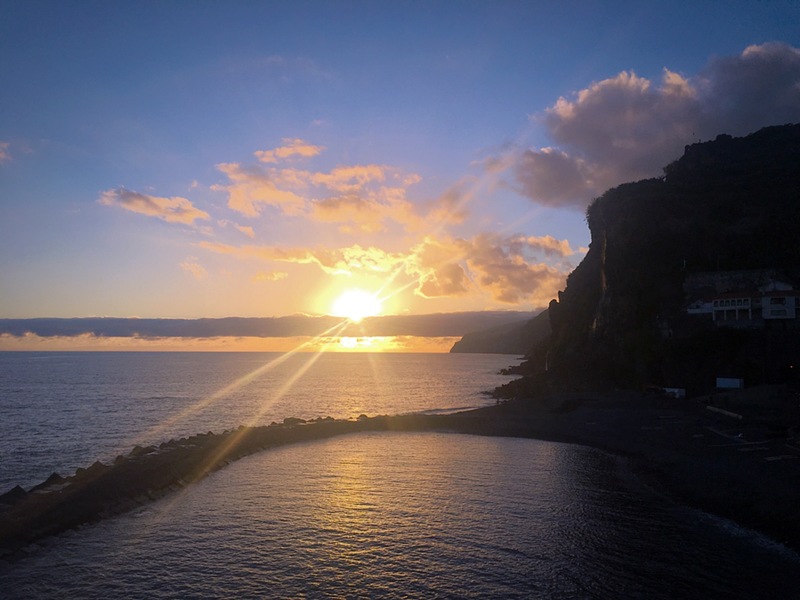 Go for the sunset at the Ponta do Sol town. The smaller terrace of Restaurant Sol Poente (facing the village and ocean) is perfect spot for a sundowner (food is very average – better for snack/drink). Unless you really really want more sandy beaches and do not mind 5 hours ferry travel, I would suggest spending your time on Madeira only. Day trip to Porto Santo is hectic. I would suggest doing it if you can spare one night or two to spend there. Do check ferry schedules before going there. Always check travel requirements before. But you can travel there on Schengen visa as it is part of Portugal. a day trip by car. Apart from my personal favorite Fajã dos Padres, I can recommend some other options below. Generally, I would suggest staying somewhere outside Funchal as it is more relaxing and less busy (avoid Lido area unless you love tourists all around you). South of island is usually warmer and has more sun. Madeira traditional cuisine has a lot of meat in it, and apparently, they love this Brazilian rodizio kind of restaurants. But you will always find sea food or vegetarian meal if you plan a bit and look up the restaurant before you go. I would mention some food places not to be missed. A Confeitaria – perfect for a coffee, cake or a little sandwich when visiting Funchal Farmer market. Also, the café restaurant at the top roof of farmer market is great. 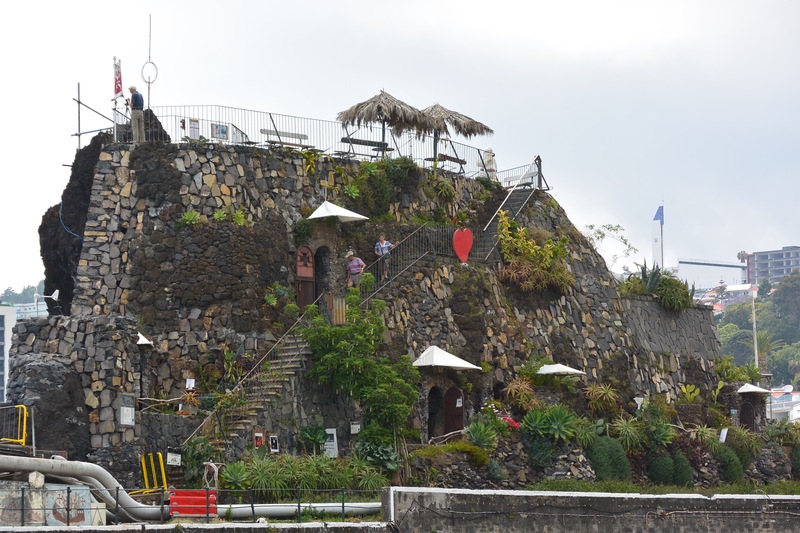 Fajã dos Padres Restaurant – of course! I hope this post encourages you to go and explore this beautiful, charming little island. And you can always get in touch with me for questions while you plan your itinerary. P.S. 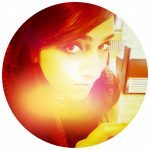 Do not forget to follow @beetravelista on Instagram. And if you find the post useful, do leave a comment. Thanks! lovely place you got here. Just find you using yahoo! Thank you all you enthusiams into this work. As if my bucket list wasn’t already long enough… this looks right up my street! I love the idea of a farmstay; I find local experiences like that the best part of a trip. Thanks for making me wanderlusty! 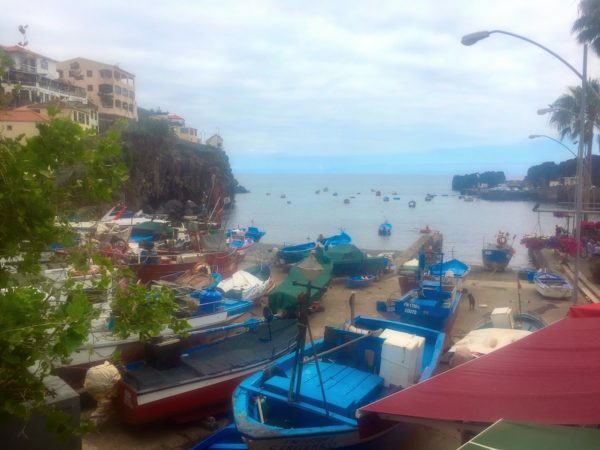 So, I’d never heard of Madeira until I started blogging. Now I want to take a walk on the clouds! Great post! I’ve never heard of this island before, but wow. Organic farms, hiking along the beach and up into the clouds, and dolphins? Count me in! Thanks for highlighting this little-known spot. Thanks Carrie. I posted some more pics from the island on my blog Instagram. I haven’t realized Madeira is located so far away from Lisbon ! I though it’s a short 30 min flight! 🙂 it looks so beautiful tho! I’ve always wanted to visit! Especially now when I see this wonderful hike Vereda da Ponta de São Lourenço! That looks like s dream! The view is stunning! Thanks. I have more pics from the hike on my blog’s Instagram account. You can check that as well. I’ve been wanting to go to Madeira for ages to do some hiking! It looks absolutely beautiful in there and I could spend days just wandering around the mountains. Didn’t know you could do dolphin and whale watching in there – would love to do that! Thanks Cristal. Yah it is lovely. And all dolphin shots I took were from my iPhone. This is super cool place for dolphin watching. I could not embed a video in my blog post, but I posted a video of this dolphin dancing on my Instagram and Facebook. Check @beetravelista if interested to see that video. Thank you for introducing me to Madeira. I think I’ve seen it on travel relocation shows before but always thought it was a super sunny beach-goer destination. Your tip on ‘cold’ swimming waters was valuable for someone like me who enjoys getting in the water! Glad it helped! Feel free to share! 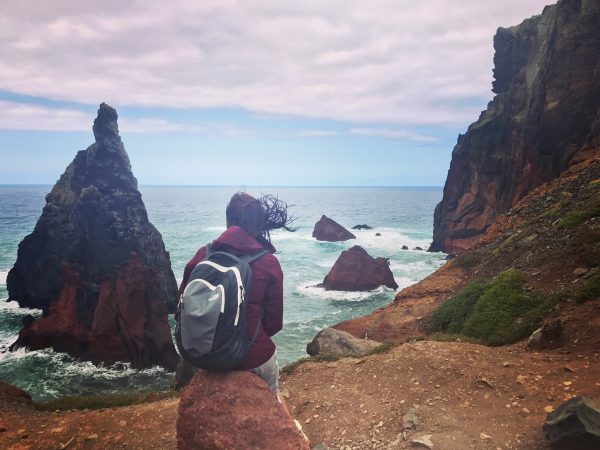 It is true there is little information on Madeira so an informative post like this one is a great contribution to the travel community. Thanks for sharing! I have been wanting to explore Madeira for a while now so perhaps I will manage to include it in my 2018 travel plans. Is there any particular time of the year you recommend? Hi Raquel, I loved end of May. But I also wrote in the post about best times to visit. I would avoid July/Aug as it might get too crowded. Ya I could not find a lot on Madeira either. Feel free to share the post!